Nissan aims to deliver 20,000 electric Leafs to U.S. drivers in the first year. LOS ANGELES (Bloomberg) -- Demand for hybrid cars and electric vehicles may be more modest than advocates for those fuel-saving technologies expect, capturing only 7.3 percent of global sales by 2020, according to a forecast by J.D. Power & Associates. Combined deliveries of hybrids, such as Toyota Motor Corp.’s Prius, and battery-powered cars including Nissan Motor Co.’s Leaf may reach 5.2 million units that year, out of an estimated 70.9 million passenger vehicle sales, J.D. Power said in the study released today. That falls short of Nissan-Renault CEO Carlos Ghosn’s prediction that electric cars alone will be 10 percent of global sales by 2020. Carmakers and governments in the U.S., Europe, Japan and China are spending billions of dollars to speed development of autos that use little or no petroleum to curb greenhouse gas emissions and reduce exposure to oil-price swings. The Obama administration committed at least $11 billion in taxpayer aid to help Nissan, Ford Motor Co., Tesla Motors Inc. and other car and battery makers get electric vehicles into production. “It’s not a matter of if, but how fast and to what extent, different electrified vehicles will be adopted as we approach an electrification tipping point,” Oliver Hazimeh, auto industry analyst for consulting company PRTM in Chicago, said today. PRTM estimates that by 2020 electric vehicles may be 5 percent of global sales; plug-in hybrids, which operate as both battery cars for brief periods and hybrids, may reach 6 percent; and hybrids will account for 20 percent, Hazimeh said. Demand may exceed 7.3 percent globally should China’s government push electric-vehicle sales at a more aggressive pace, according to J.D. Power. Global hybrid and battery-electric vehicle sales may total 954,500 in 2010, or 2.2 percent of vehicles likely to be sold in 2010, the company said. Hybrid and electric cars have been niche products in global markets so far, purchased mainly by people who are older, more educated and have higher incomes than the average consumer, J.D. Power said. “Many consumers say they are concerned about the environment, but when they find out how much a green vehicle is going to cost, their altruistic inclination declines considerably,” Humphrey said. In the U.S., the number of people who say they’re interested in buying a hybrid drops 50 percent when they learn such vehicles typically cost about $5,000 more than equivalent models with gasoline engines only, he said. Based on consumer interviews, J.D. Power said concerns about advanced vehicles include their looks and design, reliability, overall power and performance, range and time needed to recharge battery packs. Toyota’s Prius is the world’s best-selling alternative-fuel vehicle, with cumulative deliveries of more than 2 million units since it was introduced in Japan in 1997. Sales of the Leaf and General Motors Co.’s plug-in Volt sedan, likely to be the top- selling U.S. rechargeable models in 2011, begin late this year. 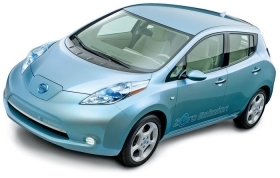 Nissan aims to deliver 20,000 Leafs to U.S. drivers in the first year. The car travels as far as 100 miles (160 kilometers) on a full charge of its lithium-ion batteries. The Yokohama, Japan-based company plans to develop enough plant capacity to be able to build as many as 500,000 Leafs worldwide by late 2012.